I cooked this for a party recently and am keeping on this blog some cooking notes of this recipe. 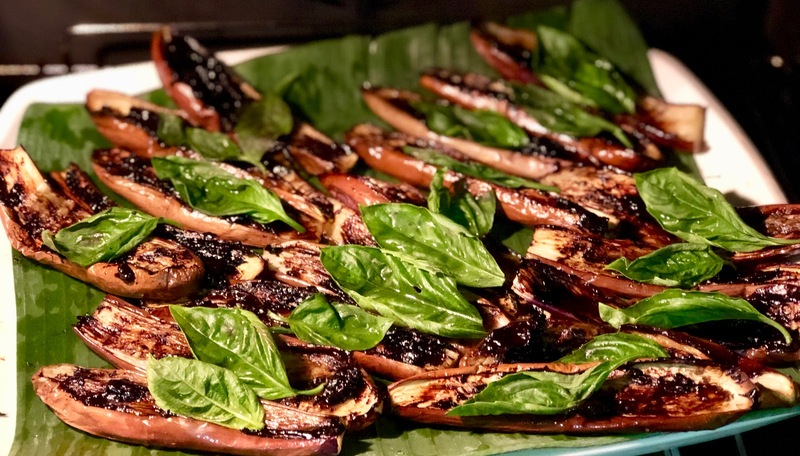 This is a common way of cooking brinjal by roasting it in an oven. The ingredients I use is rather exotic but the sweetish black garlic and the savoury black salt combines well. The black salt has a slightly pungent eggy smell. I love the flavour. If you have these ingredients, it is easy to prepare this. The black garlic is already cooked. You mix it with the Himalayan salt in a blender and use it to spread on the roasted brinjal. I won't state here the quantity involved and ti is best that you mix and prepare the paste according to your taste. I am sure you get the idea here. You can replace the black garlic paste with roasted garlic and kecap manis and soy sauce. Just experiment with your paste. Mix the black garlic bulb and the salt in a blender or chopper or lesong till it is smooth. Slice the brinjal and coat is generously with olive oil. Roast it skin side down in the oven at 180C for 45 minutes. Spread the black garlic paste and serve immediately, garnished with basil or coriander leaves. You can serve it with rice or as a vegan dish in a buffer spread.